Northern Westchester Hospital’s annual Teddy Bear Clinic will be held on Saturday, April 13th, from 8:00 am – 10:30 am in the Mary & David Boies Emergency Department. 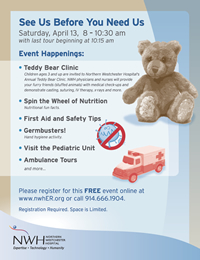 The NWH Teddy Bear Clinic is a positive learning opportunity for children to experience first-hand what might happen if they visit their doctor, hospital, or hospital emergency department. This popular family event teaches children about medical treatments and healthy habits in a warm and friendly manner. Children and their “patients” will observe and learn about X-rays, splints and stitches, casting, and take a tour of the NWH pediatric unit. They can also participate in interactive activities on exercise and healthy eating, first aid and safety, germ-busting, and ambulance tours. The Teddy Bear Clinic will follow an open house format. Parents, children and their favorite stuffed animal can arrive anytime between 8:00 am and 10:30 am. We hope that children will have a great time and learn that they don’t have to fear a trip to the hospital. Click here to find out more or to RSVP.